Kawhi Leonard’s debut in his new home arena will have to wait. Leonard was one of the regulars who rested Friday night, when the Toronto Raptors defeated Melbourne United 120-82. The Raptors scheduled five preseason games this season, but Friday’s was the only one that’ll be played in Toronto. Kyle Lowry also got the night off for the Raptors, who don’t play again in Toronto until the season-opener Oct. 17 against Cleveland. Melbourne stayed with Toronto for much of the first half. After 18 minutes, Toronto’s lead was 34-31. 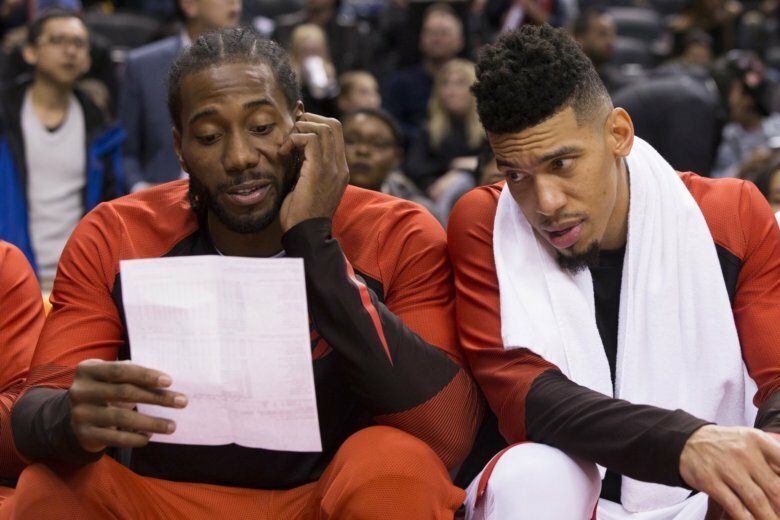 Over the next 18 minutes, the Raptors outscored their Australian guests 67-27 and took a 101-58 lead into the fourth quarter. UNITED: Casper Ware and Chris Goulding led Melbourne with 17 points apiece. … Peter Hooley, whose 3-pointer with 1.6 seconds left in the 2015 America East final gave Albany a 51-50 win over Stony Brook — and made headlines because Hooley was still grieving the loss of his mother, who died that season — had five points in 17 minutes. RAPTORS: Norman Powell led the winners with 21 points, and Pascal Siakam added 19. … Siakam was plus-50 in 27 minutes and Delon Wright, who finished with 15 points, was plus-49 in 26 minutes. … Besides Leonard and Lowry, the Raptors were also missing C.J. Miles (rest), Fred VanVleet (stiff hamstring), Chris Boucher (back spasms), and OG Anunoby (personal reasons). UP NEXT: Toronto (2-1) faces Brooklyn in Montreal on Wednesday. JJ Redick was 10 for 10 from the field, 7 for 7 from 3-point range, and led all scorers with 28 points off the bench for Philadelphia in the opener of the China Games. Joel Embiid finished with 22 points for Philadelphia (3-0). Dennis Smith Jr. scored 20 for Dallas (1-1). MAVERICKS: Dallas was without Dirk Nowitzki (recovering from ankle surgery), DeAndre Jordan (death in family) and Harrison Barnes (right hamstring strain). … This is Dallas’ first preseason trip abroad since playing games in Germany and Spain in 2012. … Maxi Kleber scored 17 points and rookie Luka Doncic was one of three Mavs to score 11. 76ERS: Ben Simmons nearly had a triple-double, finishing with nine points, nine rebounds and 10 assists. … Landry Shamet scored 18 for the 76ers, who committed 35 fouls. 76ers coach Brett Brown used 13 players and all 13 had at least one foul, and three players — Embiid, Robert Covington and Markelle Fultz — all finished with five fouls, despite none playing more than 24 minutes. UP NEXT: The teams play again Monday in Shenzhen, China. Aaron Gordon scored 29 points and grabbed eight assists in 24 minutes, shooting 10 for 12 from the field and leading Orlando to an easy win over the Brazilian club Flamengo. Flamengo had a pair of notable former NBA players; Anderson Varejao finished with 14 points and 12 rebounds, and Leandro Barbosa scored eight points. The teams made a combined 91 percent of their free throws — 21 of 22 by the Magic, 21 of 24 by Flamengo. FLAMENGO: Marcus Vinicius Souza led the Brazilians with 19 points. … Flamengo had 11 shots blocked, and didn’t block any of Orlando’s 81 attempts. MAGIC: Nikola Vucevic finished with 21 points and seven rebounds. … Rookie Mo Bamba played 19 minutes, piling up 12 points, nine rebounds and four blocked shots. Bamba shot 5 for 7, and the Magic shot 54 percent as a team, compared with 31 percent by Flamengo. UP NEXT: Orlando (1-1) is at Miami on Monday. Paul George made his preseason debut and scored 13 of his 23 points in the first quarter, and Oklahoma City never trailed. Karl-Anthony Towns scored 23 points for Minnesota. But Andrew Wiggins struggled, scoring four points on 2 for 9 shooting in 28 minutes. THUNDER: Steven Adams had 14 points and 13 rebounds in 25 minutes. … Oklahoma City outrebounded the hosts 57-39, and led by as many as 22 points. … Dennis Schroder, Nerlens Noel and Jerami Grant each had 12 points for the Thunder. TIMBERWOLVES: This was Minnesota’s only preseason appearance at its home arena, and fans booed coach Tom Thibodeau during introductions — clearly unhappy about the unresolved Jimmy Butler situation. … Jeff Teague scored 17 points and Derrick Rose added 11 for Minnesota. UP NEXT: Oklahoma City (1-1) faces Atlanta in Tulsa, Oklahoma, on Sunday. Minnesota (1-2) faces Milwaukee in Ames, Iowa, on Sunday. Bradley Beal led six Washington players in double figures with 20 points, and the Wizards outscored Miami 70-55 in the second half. Jeff Green scored 15 points and Markieff Morris added 13 points and 10 rebounds for Washington. Yante Maten and Justise Winslow each scored 17 points for Miami. HEAT: Miami held eight players — Josh Richardson (thigh), Tyler Johnson (migraine), James Johnson (surgery rehab), Wayne Ellington (ankle), Derrick Jones Jr. (shoulder), Bam Adebayo (shoulder), Dion Waiters (surgery rehab) and Marcus Lee (knee) — out with injuries or illness, and then kept Dwyane Wade and Goran Dragic out after halftime. … Wade had all 10 of his points in a 9-minute stretch of the first quarter. WIZARDS: John Wall had nine points and nine assists in 24 minutes, and missed all five of his 3-point tries. … Dwight Howard (back) did not play. … Washington fouled 3-point shooters twice in a 17-second span early in the fourth quarter, leading to six Heat points — a four-point play by Duncan Robinson and two free throws by Malik Newman. UP NEXT: Miami (0-3) hosts Orlando on Monday. Washington (0-2) visits New York on Monday. Tim Hardaway Jr. scored 21 points and Enes Kanter added 20 points and 15 rebounds for New York, which has played three down-to-the-wire games in as many outings so far in this preseason. Kevin Knox (12 points, 10 rebounds) and Noah Vonleh (10 points, 11 rebounds) also had double-doubles for the Knicks. Ashley Moyer-Gleich, one of two women selected by the NBA as non-staff referees to start this season, was part of the crew on the game. PELICANS: Nikola Mirotic had 19 points and 12 rebounds, and Anthony Davis had 15 points and 13 rebounds for New Orleans. But combined, Mirotic and Davis shot 12 for 37, 2 for 15 from 3-point range. … Darius Miller added 15 points for the Pelicans. KNICKS: New York has won its three preseason games by an average of 4.7 points. … The game was the Madison Square Garden debut for Knicks coach David Fizdale. … New York scored 93 points through three quarters, and won despite adding only 13 to that total in the fourth. UP NEXT: New Orleans (0-3) visits Miami on Wednesday. New York (3-0) hosts Washington on Monday. Marc Gasol scored 21 points and MarShon Brooks scored 18 off the bench for Memphis, which scored 29 points off Atlanta turnovers. Memphis led 113-84 with 7:54 left, before the Hawks outscored the Grizzlies 26-7 the rest of the way and got within nine points in the final minute. Tyler Dorsey led the Hawks with 18 points. HAWKS: Trae Young scored 15 for Atlanta. … The Hawks outscored Memphis by 16 points when rookie guard Kevin Huerter was on the floor, and was outscored by 26 points when he was on the bench. GRIZZLIES: Mike Conley scored 11 points. … Japan’s Yuta Watanabe, who played his college ball at George Washington, made his preseason debut with 7:20 left. … Memphis used 18 players. UP NEXT: Atlanta (1-1) faces Oklahoma City in Tulsa, Oklahoma on Sunday. Memphis (1-1) hosts Indiana on Saturday. Dejounte Murray scored 16 points for San Antonio, and Rudy Gay scored seven points in a 14-0 first-quarter run that put the Spurs in control. LaMarcus Aldridge added 14 points for the Spurs. Andre Drummond led Detroit with 18 points and 10 rebounds. PISTONS: Henry Ellenson and Stanley Johnson each scored 11 points. … The Pistons tried 39 3-pointers, compared with only 14 attempts from deep by the Spurs. SPURS: Pau Gasol had a perfect shooting night — 4 for 4 from the field, 4 for 4 from the line, 1 for 1 from 3-point range for 13 points. … DeMar DeRozan scored six points in 20 minutes. UP NEXT: Detroit (1-1) hosts Brooklyn on Monday. San Antonio (2-0) hosts Houston on Sunday. Rookie Monte Morris had 15 points and nine assists, Malik Beasley added 14 points with four 3-pointers and the Denver Nuggets avoided becoming the first NBA team to lose to an international squad since 2016. Bryce Cotton kept the Perth Wildcats in it with five 3-pointers and 33 points. His 3-pointer with 3:46 remaining in the third quarter pulled Perth to 66-63. The Wildcats got as close as 69-68 in the second half. WILDCATS: Cotton scored 17 of Perth’s opening 28 points, but the Wildcats trailed by 17 points. He had 28 through three quarters on 10-of-17 shooting. … Jesse Wagstaff added 18 points. NUGGETS: Nikola Jokic had three points and seven rebounds in 22 minutes. Paul Millsap added five points and nine boards. UP NEXT: Denver (3-0) plays at the Los Angeles Clippers on Tuesday. Donovan Mitchell was 7 of 14 from the floor for 18 points — all in the first half — and Utah cruised in its final preseason home game. Nathan Sobey led the Adelaide 36ers with 25 points as all five starters had at least nine points. 36ERS: Sobey made 6 of 8 shots in the first half for 18 points, and he finished 8 of 15. … Ramone Moore scored 13 of his 16 points by halftime. JAZZ: Aussie Joe Ingles scored three points in 16 minutes against his hometown club. … Rookie Grayson Allen made four 3-pointers and scored 16 points. … Ricky Rubio had 13 points and five assists. … The Jazz bench combined for 87 points. … Rudy Gobert rested. UP NEXT: Utah (3-0) plays at Portland on Sunday. Jusuf Nurkic had 16 points and nine rebounds for Portland in a battle with No. 1 overall pick DeAndre Ayton. Ayton led Phoenix with 19 points and 14 rebounds in 23 minutes. TRAIL BLAZERS: Damian Lillard and CJ McCollum each played 21 minutes. McCollum had nine points, seven rebounds and five assists and Lillard scored eight points. … Jake Layman made all four of his field goals for 13 points. … Former Blazer Brandon Roy sat courtside. SUNS: Devin Booker and No. 10 selection Mikal Bridges did not play. UP NEXT: Portland (1-1) hosts Utah on Sunday. Phoenix (1-2) plays at Golden State on Monday. The Blazers and Suns will meet again in Portland on Wednesday. Klay Thompson made six 3-pointers and scored 30 points and Kevin Durant had 26 points, six rebounds and seven assists in his first game in Seattle since 2008. It was a star-studded affair at KeyArena. Seattle-area resident and Celtics legend Bill Russell was in attendance, as well as former Sonics Spencer Haywood, Gary Payton and Detlef Schrempf. Rapper Macklemore sat courtside. Durant addressed the crowd before the game wearing a retro Shawn Kemp jersey. He congratulated the WNBA champion Seattle Storm — with Sue Bird and Breanna Stewart in attendance. Harry Giles scored 17 points for Sacramento. KINGS: Former King DeMarcus Cousins did not play for the Warriors. WARRIORS: Thompson made two 3-pointers during Golden State’s game-opening 10-0 run. He had five 3s in the first nine minutes, and the Warriors led 39-15 after the first quarter. The Warriors extended it to 74-44 by halftime with 25 points from Thompson. Durant had 17 points, six rebounds and four assists. … Stephen Curry did not make the trip for personal reasons. UP NEXT: Sacramento (1-2) hosts Haifa on Monday. Golden State (1-1) hosts Phoenix on Monday.